It should be no surprise that the LLTO Coach of the Year is none other then young rookie La Liga Primera Division manager Josep Guardiola of Barcelona. Guardiola suceeded Frank Rijkaard as Barca’s coach for the 2008/2009 season and the former Barca star defensive midfielder brought with him his championship winning ways. Pep won six titles during his playing days for Barca and coaching the club this season, earned his first ever career treble: winning the La Liga, Cop del Rey, and the UEFA Champions League titles. It was a successful rookie year to say the least for the new coach. Perhaps Guardiola’s greatest accomplishment this year was how he was able to get the most out of the offensive side of the pitch for his club. The club improved from scoring 76 goals in 2007/2008 t to 105 total goals in 2008/2009 (a difference of 29 goals). The club also improved to the best defensive numbers in the entire league only allowing 35 goals on the year. The most impressive statistic though, is that Pep was able to improve the squad 20 total points this season from 67 to first place 87. Barcelona was clearly the best squad in the world this year. They won the biggest international tournament, the biggest league tournament, and also cruised to a La Liga title with nearly a month left in the season. They have more weapons (Messi, Henry, Eto’o, to name a few) then just about any other squad in the world. So Josep Guardiola does have his advantages over other clubs, but the manager was able to pull off one of the rarest feats in all of European football. 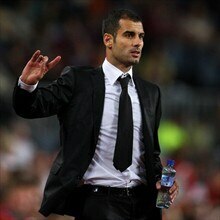 Congrats to Mr. Guardiola and Barcelona, I have a feeling that we will be hearing more about Barca’s incredible season. But lets get on with the awards!